Accused murderer, Larry Walker, on his "Perp Walk" prior to arraignment. Larry Lidale Walker was arraigned on first degree murder and other felony charges Monday morning in Union County Justice Court. 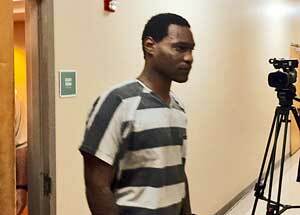 Larry Walker faces multiple felony charges in Ingomar murder of Leon Lewis. The charges are related to the Leon Lewis murder early Saturday evening, March 17, at a residence at 1064 County Road 92 in Union County. Lewis died about midnight Saturday at The MED in Memphis. He had been shot multiple times with a 9 mm semi-automatic hand gun. Lewis was Walker’s step father. Further details of the shooting event are in a story posted Sunday on NAnewsweb.com. (See link below). Justice Court Judge David Garrison explained to Walker that he was charged with first degree murder, possession of a firearm by a convicted felon, possession of a stolen firearm, and child endangerment. Garrison set Walker’s bond at $1-million on the first degree murder charge. Bond was set at $10-thousand on each of the firearms charges and at $5,000 on the child endangerment charge. Total bond for Walker is $1,025,000. Walker was born February 13, 1991 (age 27). His place of residence is given as 1064 County Road 92, Lot 1, New Albany. Before the Lewis murder, the Mississippi Department of Corrections already had a warrant for Walker’s arrest for parole violation on an armed robbery out of Sunflower County. Records do not indicate a place of employment for Walker. 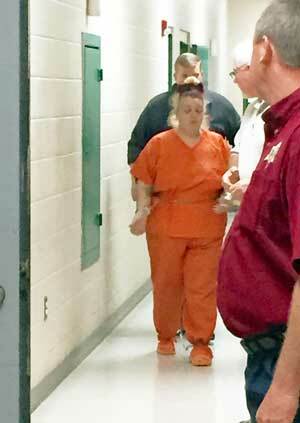 Nicole Lynn Vanvranken arraigned in Leon Lewis murder incident. Walker will have a preliminary hearing Tuesday morning. It is expected he will be bound over for possible indictment later by a Union County grand jury. Garrison appointed New Albany lawyers Anna Kate Robbins and Mason Williams as attorneys for Walker. Also arraigned Monday morning was Nicole Lynn Vanvranken, DOB Sept. 1, 1989 (age 28), of the same County Road 92 address. Vanvranken was charged as an accessory after the fact to the murder of Lewis and also received a misdemeanor charge of possession of marijuana. Bond was set at $25,000 on the accessory charge and $1,000 on the marijuana charge. Jail records indicate Vanvranken has been employed by Best Western in New Albany. For more on this story: Child still in car when his father was murdered.